The Presenting Author must make Pre-Registration. If the authors do not make Pre-registration before deadline, their work may be removed from the program. In case of your making on-site registration, please inform us in advance. The secretariat needs a confirmation of attendance to finalize the scientific program. It is required to submit MS-PowerPoint slides or video data at the PC registration desk (in the foyer of Room 1: Tenpi) at least 2 hours before presentation start time. It is strongly recommended for authors in the morning sessions to submit their slides the day before the presentation. Authors should make sure all fonts appear as expected and all sound/video clips are working properly while reviewing presentation slides. The poster presentation will be operated on poster boards. 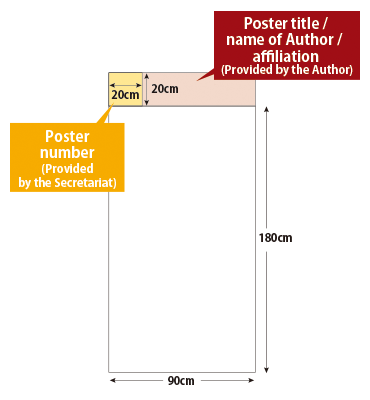 Bring your printed poster to Deigo & Adan (Poster Room), check in onsite at the Poster registration desk in front of the Deigo & Adan and set-up between 13:00-14:00 on both dates. Please remove posters no later than 1 hour after poster session ends on each day (18:00-19:00 on Nov 2 and 17:00-18:00 on Nov 3.). Please note that remained posters at the end of each day will be removed by the organizer since all poster boards must be cleared in preparation for the next day. Copyright © 2nd Congress of Asia-Pacific Society of Thyroid Surgery. All Rights Reserved.